A teenager teams up with the daughter of author RL Stine after the writer's imaginary demons are set free. A live-action adaptation of RL Stine’s massively popular novels, 2015’s Goosebumps introduces us to Zach Cooper (Dylan Minnette), a teenager who moves to a small town in Delaware. At first, this new location seems promising, mainly because he lives next door to pretty Hannah (Odeya Rush). Hannah’s dad is famous author RL Stine (Jack Black), and he has a secret: all those Goosebumps monsters really exist, and he keeps them locked up in their books. When Zach accidentally lets these beasties loose, he and the Stines need to recapture them and halt their potential menace. I never read the Goosebumps books, mainly because I was way too old to be part of their target audience. Stine’s first Goosebumps tale hit the shelves in 1992, so as an elderly 25-year-old, the series didn’t land on my radar. Even without any foreknowledge, I have to assume Stine himself didn’t play a role in the stories like he does here. The film goes for a “meta” approach, and that’s not a terrible move, as it gives the story an unexpected twist. Outside of that clever choice, Goosebumps comes with a feeling of familiarity, as it traces a path taken by other “family-friendly” horror tales in the past. 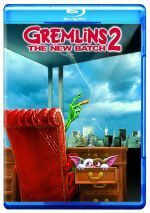 In particular, Gremlins feels like a major influence, as Goosebumps clearly reflects its emphasis on laughs and terror. This doesn’t make Goosebumps truly derivative, though, as it musters a tone and energy of its own. Like Gremlins, the horror never threatens to actually become scary, but those scenes still offer thrills. The funny side of Goosebumps works best, and the cast reflects a desire to pursue that path. In addition to Black, the film includes comedic talents like Jillian Bell, Timothy Simons and Ken Marino, all of whom add mirth to the proceedings. My only casting gripe might connect to Minnette, though not due to his performance. While he doesn’t light up the screen, he provides a more than competent lead turn. No – the problem comes from the fact that he looks like he’s about 30 years old! 18 during the shoot, Minette is actually slightly younger than co-star Ryan Lee and only five months older than Rush, but those last two simply pass for right age better. The calendar said Minnette was fine for the high school part but my eyes told me he was done with grad school. A more objective negative relates to the movie’s CG effects, as they’re simply not very good. They’re not so terrible that they take me out of the story, but they’re fairly unconvincing too much of the time, especially with organic creatures like a werewolf. Despite those issues, I think Goosebumps becomes a mostly enjoyable romp. Its combination of action, light scares and comedy makes it a fun 103 minutes. 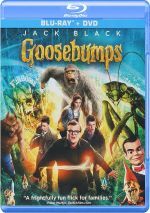 Goosebumps appears in an aspect ratio of approximately 2.40:1 on this Blu-ray Disc. This became a high-quality presentation. Sharpness was fine, as the movie offered solid clarity. Virtually no softness interfered with this tight, concise image. I saw no moiré effects or jaggies, and the film lacked edge haloes. Source flaws were non-existent, as I detected no specks, marks or other blemishes. The film’s palette usually opted for a standard orange and teal orientation. Within that design range, the colors seemed strong. Blacks showed nice depth and darkness, while low-light shots presented appropriate delineation and smoothness. Across the board, the image looked terrific. 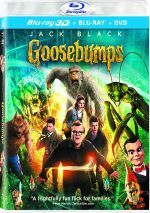 I also felt pleased with the Dolby Atmos soundtrack of Goosebumps, as the soundfield appeared broad and engaging throughout the movie. Downconverted to Dolby TrueHD 7.1, all the speakers got a strong workout as they displayed a lot of discrete audio. This made for a convincing environment, as we heard plenty of atmosphere and objects swirl actively and appropriately about us. Segments like the chases and fights stood out as particularly dynamic, and a mix of action sequences kicked things into high gear. All these elements created excellent feelings of place and brought the material to life well. Sound quality also appeared good. Dialogue was crisp and distinct. Speech showed no signs of edginess or any problems related to intelligibility. Effects were always clear and dynamic. No distortion appeared, so the track stayed clean. Music sounded appropriately bright and accurate and portrayed the score appropriately. The mix featured some pretty solid bass at times, and the entire affair seemed nicely deep. Overall, the audio provided the expected levels of involvement and activity. As we move to extras, we open with a Cast Blooper Reel. It runs three minutes, eight seconds and mainly brings the usual goofs and giggles. A few improv lines add value, though. Cut footage arrives via an Alternate Opening (3:28) and seven Deleted Scenes (12:39). The “Opening” hints at the mayhem yet to come. It features Kumail Nanjiani – absent from the final film – and it’s pretty funny. As for the deleted scenes, a glimpse of Zach’s first day at his new school fills much of the running time, as it goes six minutes. It would’ve slowed down the story, but it’s interesting in its own right. We also find an “Alternate Ending”, one that makes a pretty big change in the existing finale. It’s less crowd-pleasing, so I see why it wasn’t used. The remaining scenes offer minor tidbits. Though they offer nothing special, they’re fun to see. Four featurettes follow, and they launch with All About Slappy. It goes for four minutes, 44 seconds and includes notes from author RL Stine, puppeteer Jake McKinnon, director Rob Letterman, and actors Jack Black, Dylan Minnette and Jillian Bell. “About” gives us notes about the Slappy character’s literary origins and his adaptation for the screen. It’s use of Slappy as narrator gives us a comedic tone but it still offers decent notes, even though Black doesn’t reprise the Slappy part for the featurette. Next comes the five-minute, 47-second Beginner’s Guide to Surviving a Goosebumps Creature. It features Minnette and Ryan Lee in character as they tell us how to beat various monsters. The reel offers some entertainment value but it’s largely forgettable and promotional. Strange Things Are Happening takes up three minutes, 30 seconds and focuses mainly on Minnette’s “behind the scenes” footage from the set. He claims weird, spooky shenanigans took place during the shoot, and the clip shows the result. Like “Guide”, it presents moderate amusement. For the last featurette, we go to Creaturefied. It spans eight minutes, 56 seconds and provides comments from makeup department head Fionagh Cush and creature makeup designer Steve Prouty. They lead us through “makeup projects” to be done at home. These show how to create fake blood and a mummy mask. Kids might enjoy these tutorials. A Cast Screen Test Gallery goes for seven minutes, 16 seconds and provides these pairings: “Dylan Minnette and Odeya Rush”, “Dylan Minnette, Odeya Rush and Jack Black”, “Dylan Minnette and Jack Black” twice. They’re entertaining to see. The disc opens with ads for The Goldbergs, Pixels, Hotel Transylvania 2, The Angry Birds Movie, Open Season: Scared Silly and The 5th Wave. No trailer for Goosebumps appears here. A comedy/horror tale that emphasizes the laughs, Goosebumps delivers a fun adventure. It mixes genres in a loose, lively way that allows it to become a likable romp. The Blu-ray brings excellent picture and audio along with a decent array of bonus materials. Goosebumps offers a solid family film.